"Genetic disorders constitute a serious medical problem worldwide. This is particularly true in the Arab World, where a unique combination of social, cultural, and environmental factors has led to the preponderance of such genetic afflictions. The Centre for Arab Genomic Studies (CAGS) was established in 2003 with the specific aim of dealing with the scourge of genetic ailments affecting the Arab World and to lessen the suffering due to these diseases. In the past seven years, the Centre has planned and implemented several projects, aimed at providing and spreading information on genetic disorders, both to the lay person, as well as medical and genetic professionals. 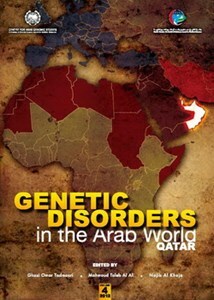 One of the Centre’s major projects has been the regular publication of its series of books on ‘Genetic Disorders in the Arab World’. So far, we have succeeded in publishing three volumes of this book, each one dealing with the issue of genetic disorders among Arabs in general, and one of the Arab countries, in particular. It is with great pride that I present to you the fourth volume in this series. After the United Arab Emirates, Bahrain, and Oman, we have concentrated on the State of Qatar. The Centre’s work regarding collection of published data on genetic disorders from this country and its curation for the Catalogue for Transmission Genetics in Arabs (CTGA) Database has led to some interesting results. We are only too eager to share these with you. As always, I cannot find enough words to express my gratitude to our patron, H.H. Sheikh Hamdan Bin Rashid Al Maktoum, Deputy Ruler of Dubai, UAE Minister of Finance, and patron of the Sheikh Hamdan Award for Medical Sciences. It is his vision that led to the establishment of CAGS, and very little could have been accomplished without his constant encouragement. I would also like to record my appreciation and gratitude to the authors who have contributed to this book, especially those from Qatar. Credit is also due to the Executive Board and the Arab Council of CAGS, as well as the office bearers of the Sheikh Hamdan Award for Medical Sciences. With the completion of its project on Qatar, CAGS has already embarked on its mission on a new Arab country. We hope to be able to present these results to you as soon as they are available. Meanwhile, I wish you a very pleasant and informative reading."